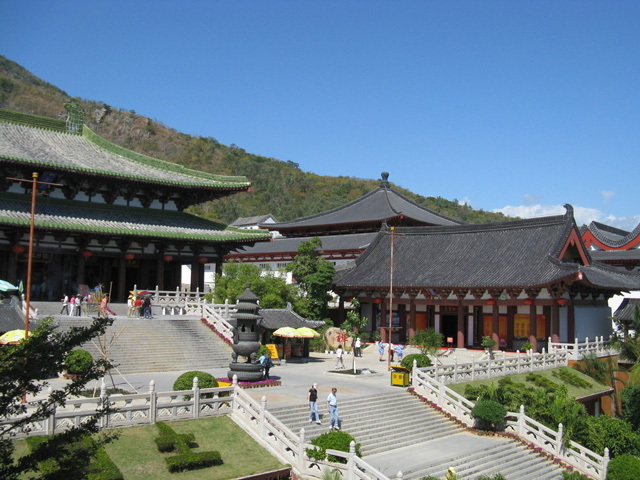 Nanshan Temple is located in Sanya Nanshan Buddhism Cultural Tourism Zone which is one of the largest cultural tourist attractions of its kind in China and is just 40 kilometres west of Sanya City along the Hainan West Expressway. Main building of the Nanshan Temple. 108-meter-tall three sided Guan Yin Statue in Nanshan Temple. 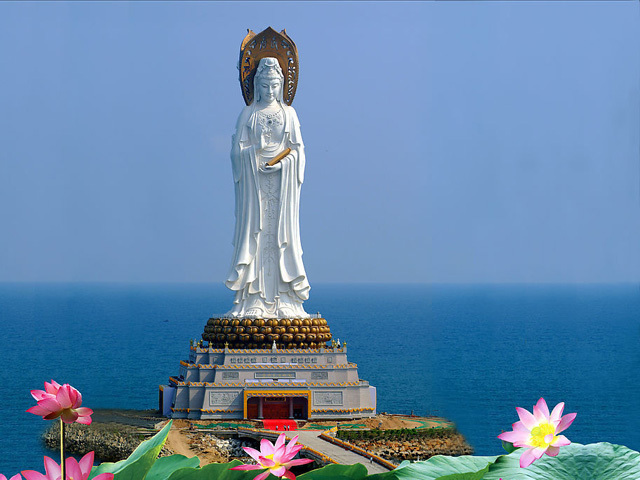 The key feature of the Nanshan Temple is the three sided statue of Guan Yin Buddha which is larger than the statue of liberty. The 108-meter-tall statue stretches towards to the sea surface for about 400 meters. Nanshan has been deemed an auspicious and blessing land in Brahma. According to the record from Buddhism scriptures, the Guanyin Buddha vowed twelve oaths to save all living beings. To dwell at South Sea permanently is the second oath of the twelve, Master Jianzhen, the renowned monk in Tang Dynasty, tried in vain five times to sail eastward to Japan for preach of Buddha's teaching. On his fifth sail to Japan, he was drifted to Nanshan. While staying in Nanshan for one year and a half, he set up a temple and did missionary work, and then, finally succeeded in his sixth voyage to Japan. The Japanese travel monk named Konghai also landed Nanshan on his way to learn Buddhism in Tang Dynasty. The well know saying "Good fortune as vast as East Sea, Long Life as great as Nanshan Mountain" shows further the Nanshan's origin of relations between Chinese traditional culture of auspicious and longevity. Backing on its beautiful sea and mountain landscape and rich historical culture resource, Nanshan will be built into several cultural theme parks and resorts including Buddhism Park. Nanshan, with its harmony and beauty, is now a tourist destination attracting more and more tourists coming from all over the world. It is here that people can enjoy them selves not only in the great tropical ecological environment with sunshine, sea, sand, blossom and greenery but also can feel with heart deep within the real beauty of peace and harmony of Buddhism culture and terse the joyfulness of returning to the nature.